The three-spray Raindance Select S 120 3jet P hand shower has three jet options: the micro-fine PowderRain, Rain, which is a full jet, and Whirl, a relaxing massage spray. Innovative hansgrohe technology means you can switch between them with just a push of the Select button. And installation couldn’t be easier: you can simply screw the new hand shower onto your shower hose. And for a cohesive look, the Raindance Select S 120 3jet P shower set comes with both the hand shower and matching shower bar. Alternatively, for those wanting to enjoy PowderRain exclusively, choose the Raindance S 240 1jet P overhead shower* for a truly luxurious shower experience. 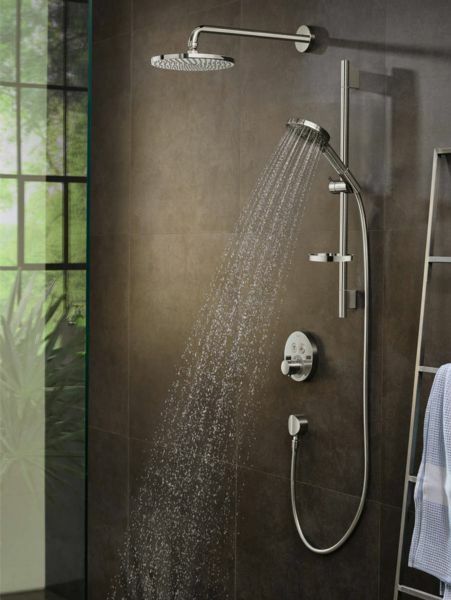 Or for the complete shower system, the Showerpipe Raindance Select S 240 1jet P* offers both an overhead and hand shower, both with PowderRain, plus a thermostatic mixer, for superior temperature control.